Ulsan, South Korea – January 22, 2019 – SONGWON Industrial Co., Ltd. (www.songwon.com) proudly announces that it has become one of the first chemical companies in the world to package its products in 20kg PE-bags made with 50% recycled PE. NORDFOLIEN is part of the RPC group. RPC Group plc is based in the United Kingdom, and with more than 190 locations in 34 countries and more than 25,000 employees it is one of Europe's largest supplier of plastic packaging and non-packaging applications. NORDFOLIEN is the innovative specialist of premium quality industrial and consumer packaging which has applications in almost every sector and field. Highest quality, top service and absolute dependability are the basis of our group’s success. Apart from industrial bag packaging for the chemical industry as well as films for transport and pallet protection we also develop and produce packaging for peat and wood processing, building industry and the food sector. Thanks to high quality of the raw materials, the sustainable recycling process and innovative recipes all NORDFOLIEN packaging is characterized by the highest levels of quality. For further information, please go to: www.nordfolien.com. 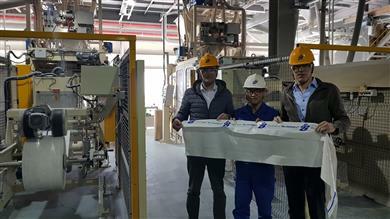 (left to right) Christian Knappik, Key Account Manager / Business Unit Chemical Industry, RPC bpi nordfolien, Hwasik Jung, Ulsan Plant Manager & Cord Manegold, Global Business Manager Main AO’s and Blends.